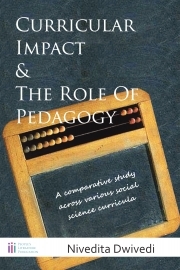 Description of "Curricular Impact & The Role Of Pedagogy"
Through a combination of desk and field study, this research attempts to look at the curricular and pedagogic aspects of social science education being imparted in schools. It is a comparative analysis of various social science curricula, with a focus on what has traditionally been taught as 'Civics'. The sample students for the field study have been drawn from upper primary classes of municipal schools, as well as a private school in Mumbai. While the prime focus of the study is on the curricular aspects, a brief attempt has also been made at analyzing the role of teachers in the teaching-learning process. A central theme that revolves around the interpretation of the term 'patriotism' has been chosen to understand the impact of the various curricula on students. Nivedita Dwivedi is an independent writer. Her primary interests lie in the field of education. She is also a regular columnist for 'The New Leam', a magazine on Education and Culture. She writes on social and human rights issues and has a keen interest in writing poetry. She has done her MA in Elementary Education from Tata Institute of Social Sciences and has undertaken this study with the Avehi Abacus Project in Mumbai. Visit her blog at fromwordstovoid.blogspot.in to know more and keep updated. Reviews of "Curricular Impact & The Role Of Pedagogy"